I recently attended a bring-a-dish dinner party to farewell a friend from town who happens to be a vegetarian. 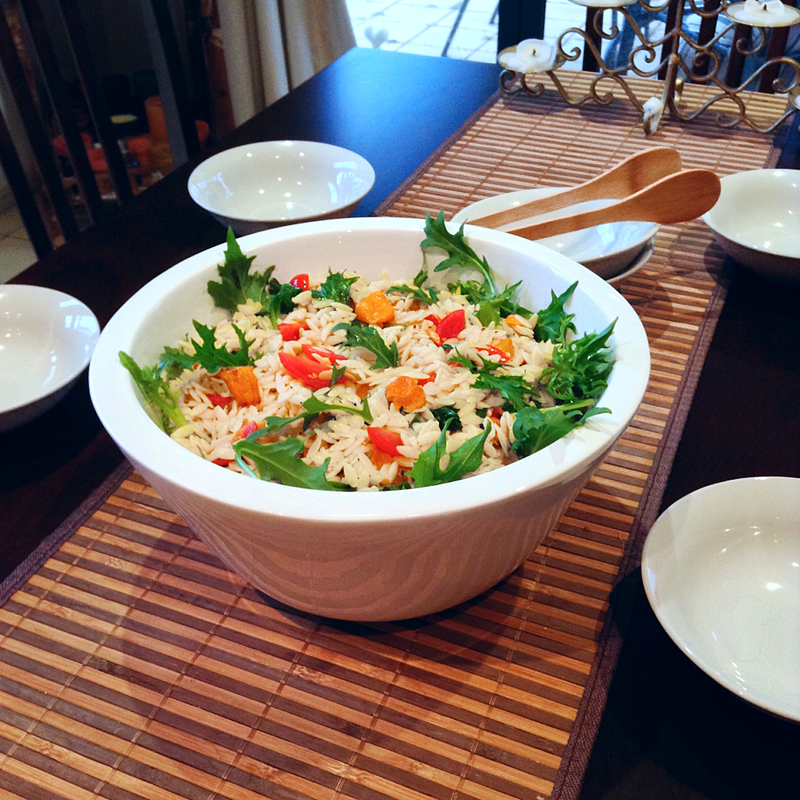 I was on salad duties and decided to whip up a Pumpkin and Risoni salad which is a personal favourite of mine. It’s light, fresh and delicious. This dish is perfect for a dinner party, BBQ or to be served with grilled fish or chicken. The lemon sings through and compliments the pepperiness of the rocket and the acidic bite from the tomatoes; while the creamy pumpkin and risoni balance the dish. Pre-heat oven to 180 degrees and a line a large baking tray with baking paper. Par-cook pumpkin in a lare saucepan of boiling water, drain and place on a lined baking tray. Coat lightly with olive oil, salt and pepper, place in the middle of the oven and bake 20-30 minutes or until golden. Meanwhile, cook risoni in a large saucepan of salted boiling water for 8 minutes or until cooked through as per packet instructions. Drain and cool. Using a peeler, peel the rind from the lemon and finely slice. Juice the lemon and reserve. Add pumpkin, tomato, rocket, lemon rind, lemon juice, olive oil, salt and pepper to risoni, toss until well combined and serve. Wonderful – let me know how it turns out! Yum what an interesting and yummy looking salad. I love pumpkin in salads! Especially with feta! Definitely going to have to make this! I thought about adding feta to this – it’s the perfect combination. YUM. Let me know how it turns out!